Yesterday, Wednesday, November 28th put a smile on my face as I finally succeeded in a long time Death Valley goal of mine - locating a non-technical route to Blue Mountain from The Borax Benchmark via Corkscrew Canyon. The day was perfect for this exploration, the temperature in the '70s, some cloud cover, no strong winds, so off I went for another go at Blue Mountain. The first two chutes on the south face of the Borax Benchmark dry-falled me for stops but the third route straight down the BM south face outside of the three main chutes into the Blue Mountain basin was the lucky charm. 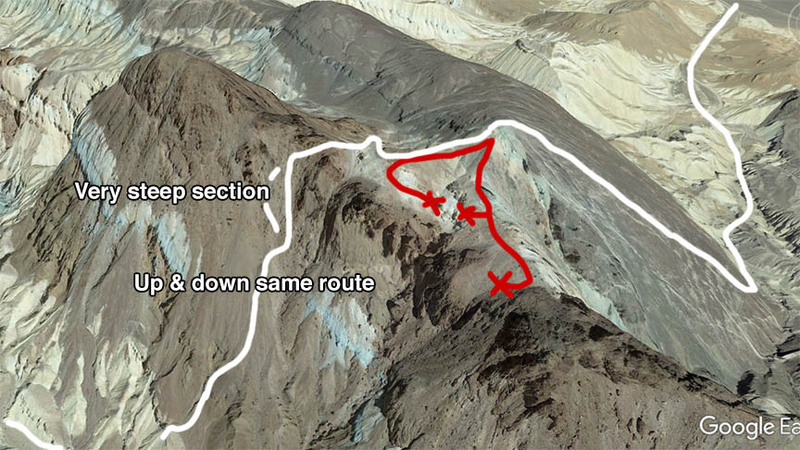 Besides the challenge of scrambling straight up the north face of the BM above the Corkscrew Canyon mine works, the crest of the BM is rather tricky to navigate around just to get access to the down routes into Blue Mountain basin. I don't think I've ever been on a hike with more ups and downs and steep slopes in such a confined area. This is possible without any rope or technical equipment if one just goes slowly and always maintains at least a three-spot balance before changing foot and hand positions. 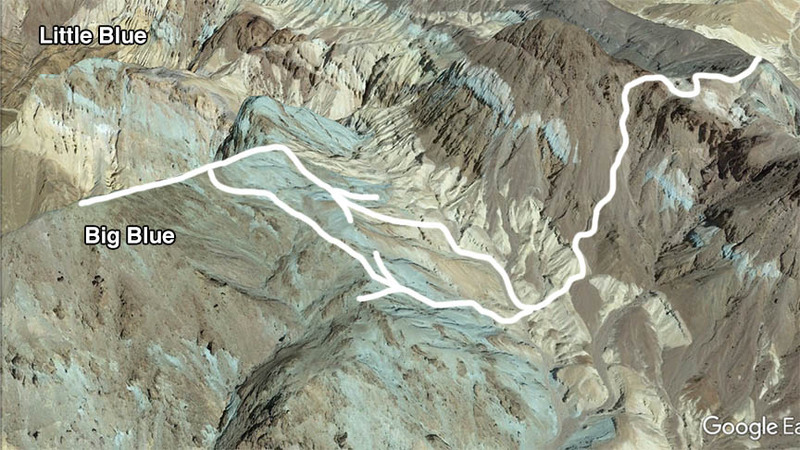 The geology has more variation from the gate off Highway 190 to the summit of Blue Mountain than any other short section of Death Valley that I know of. That last shot of the video is a good example of this. 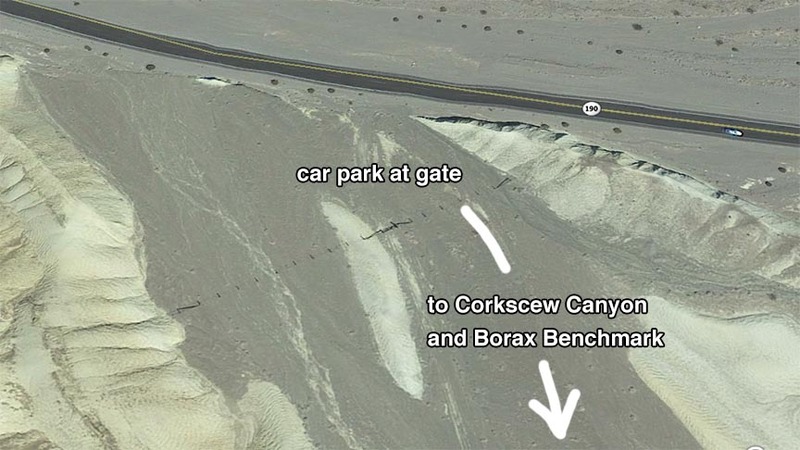 Thanks to Mojave Geek, Steve Hall, and Kauri who are to blame for tickling my curiosity about The Borax Benchmark and Blue Mountain with their exciting trip reports and images. FYI - Since I planted a summit register on Blue Mountain in September 2018, there are no new entries. I was hoping that there would be a few. I'm so glad to have completed the hike yesterday rather than today which was very windy and gusty. So this completes my adventures on and around Blue Mountain. I highly recommend Upper Artist Platte basin and Blue Mountain Basic for great geology and color. I mean "chocolate waterfalls", you can't beat that! Wow, that's very cool, I'm glad I checked in and noticed this post. I've so often looked at the topos and the sat images to see if there is a way over the Blue from the BM. I'm impressed that you figured one out. Very well done! The first two chutes on the south face of the Borax Benchmark dry-falled me for stops but the third route straight down the BM south face outside of the three main chutes into the Blue Mountain basin was the lucky charm. Looks like there are footprints on the loose slope between the BM and Corkscrew? It would make sense, as we know some people have gone that way. You end up hitting the main ridge north of the BM going that way? Can you clarify? Looks like there are footprints on the loose slope between the BM and Corkscrew? It would make sense, as we know some people have gone that way. You end up hitting the main ridge north of the BM going that way? 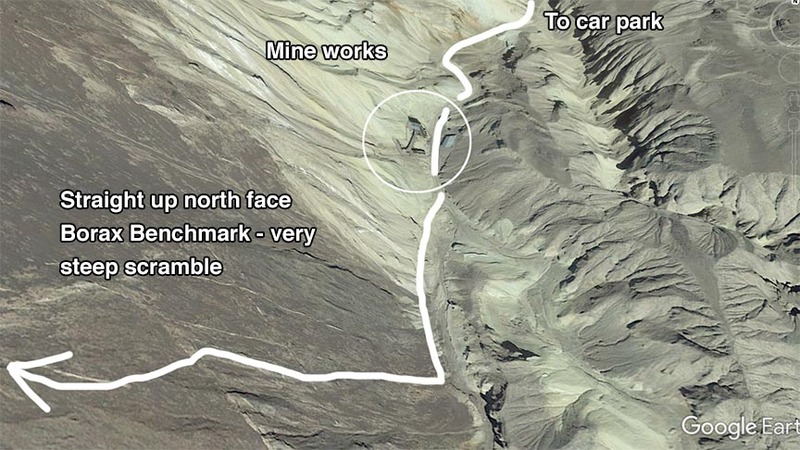 Thanks and here are some Google Earth images I've marked up to help explain. Some of those footprints are mine and some are from previous hikers, maybe even yours. First some side comments. I don't recommend going straight up the BM north face from the mine works. It's super steep and slippery. A more circumspect route up Upper 20 Mule Team might be easier, but then it's much longer. In reality, there just is no "easy route" to Blue Mountain. 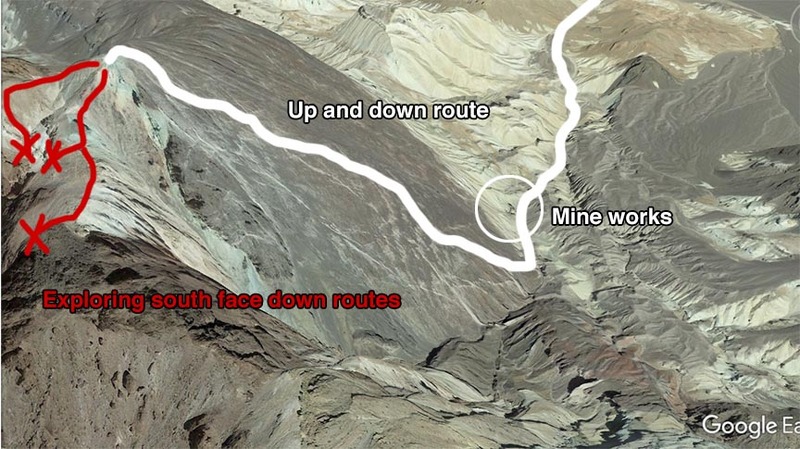 The downslope on the south face of BM is also just as steep as the ascent from directly above the mine works. Much of the descent was me turned with my stomach facing the face as I "laddered" myself carefully down. Returning up the same route is much easier and faster because it's like climbing a steep staircase - no problem. As you probably know that descending a virgin route down steep grades takes caution and time. Also skiing and sliding down the north face back to the mine works is heaps of fun. Scrambling up the east face of Blue Mountain is strenuous but enjoyable. The return down is harder on the knees. I usually prefer to go up as opposed to going down due to the knee strain. Hiking poles will be most useful. I've never tried those strap-ons, light crampons for traction but they might help. High-quality hiking boots that fit perfectly sure help. Ending note: All of the energy I've burned up on the quest for Blue Mountain and the surrounding basins has been so worth it. Depending on the time of day and the light, the views, color, and geology can not be topped. Once you reach the summit, you'll feel the same way. I have images flash back into my mind of this location frequently. Your panoramas of The Borax Benchmark really set me off, so thanks again. Very good, thanks Dazed! Much appreciated. Indeed the route down toward Blue from the BM is pretty steep! Yikes. But obviously can be done. I would be inclined to take the longer route up to the BM and then the express route down; going down that stuff isn't so bad. When you drop down the Blue side of the BM, are you on solid rock or loose rock? That may be key for me. I'm glad that pano of mine motivated you! The blue just blew me away that day. My buddy Eric said it was one of the best views he'd had in the valley. And I find it really nice to get some sort of obsession in my brain which keeps me moving toward a goal. I've only been the the blue base of Blue so far, but it took a couple of tries, and my crew tried to mutiny on the second attempt, but it really felt great to finally be able to sit at the base of the blue stuff. You're welcome. Dropping down the Blue side of BM (south face) is on a combination of solid rock and loose scree, small and large boulders. The good news is that one can easily find purchase on either the solid exposed rock or larger stable rocks to lower oneself down. No ropes are needed and a group of three or four could each wander and meander their individual routes down spaced out so as not to roll rocks on top of each other. Going back up is rather simple, like climbing up a rock piled ladder. Don't forget your gloves. I've worn out several leather pairs before finally settling on these because of the best grip and tight elastic band around the wrists which keeps out the dust and pebbles really well. 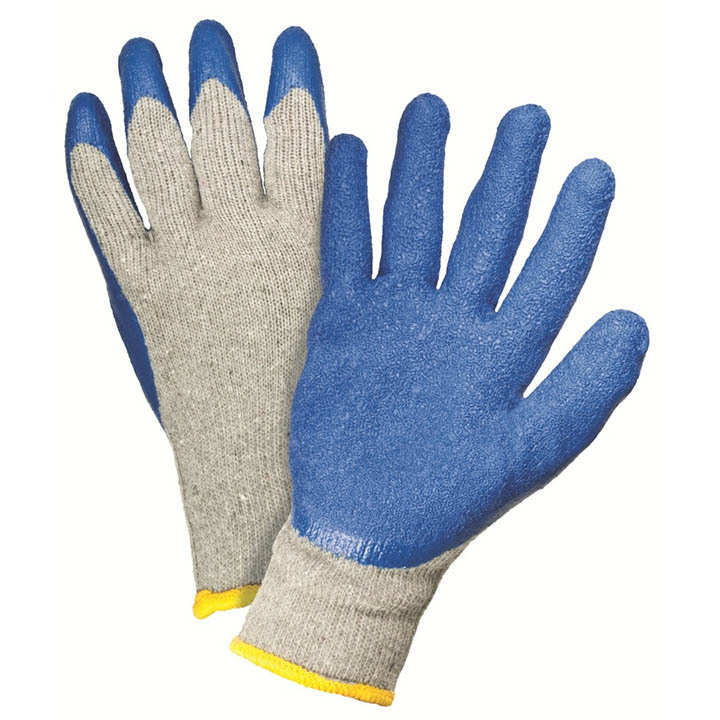 They are amazingly durable and tear resistant too. Home Depot or Lowes carries them for cheap. Make sure everyone has a pair and carry an extra just in case. I really do hope that you and many others will summit Big Blue so I can enjoy the trip reports and photos. Very nice routefinding! And quite a trek. Interesting area. I've not had time on our trips to explore much there, but perhaps on our upcoming trip I'll try a milder hike somewhat to the northwest, starting on 20-mule team road. It looks like your route follows rough country! Congrats! ... perhaps on our upcoming trip I'll try a milder hike somewhat to the northwest, starting on 20-mule team road. Thanks and you're wise to take the more moderate route to the Borax Benchmark. The views are spectacular from the BM and even better from the summit of Blue Mountain. FYI - Since I planted a summit register on Blue Mountain in September 2018, there are no new entries. I was hoping that there would be a few. I've publicized your route a little bit, by posting about it in the forums at Lists of John! I need to sit down and go through all your posts about Blue Mountain, and A) determine if it looks like something that's within my comfort limits and B) trace out the route with the goal of uploading a track or at least some key waypoints into a GPS! Candace, thanks for spreading the word about Blue Mountain. I doubt it will become overrun due to its remoteness and challenging approaches. It just occurred to me how fun it would be to have two separate parties head out for the summit. One from Upper 20 Muleteam Canyon and one from Artist Palette and see how close to summiting simultaneously would work out. Imagine sitting on the summit, having lunch together and comparing notes. Then for more fun, the two parties switch descending routes and meet up at The Oasis for dinner and compare more notes. That would make one helluva a supergroup trip report! Maybe continuous contact between the groups via sat phone, radio, or walkie-talkie could be added for spice? Another option is for just one party to start at 20 Mule, Summit and then descend to Artist Palette with some carpooling action. If the right day, weather and people combined, it would be a most memorable day in the park! I wonder how many peeps on this list would be up for this?